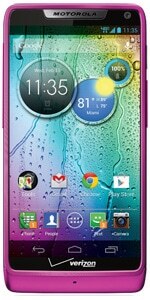 The Motorola Droid Razr M 4G LTE is an Android 4.1 smartphone with NFC. The device was announced in August 2012 and features a 4.3-inch qHD Super Amoled display and a Snapdragon S4 processor. The Droid Razr M 4G LTE, also known as the XT907, is available on Verizon in the US.